Film, 25 minutes. The door said private so I didn't go in. A man was standing there looking at something in the dark and I heard a soundtrack, so I thought he was screening some kind of film production. When I finally realized that the room was part of the gallery I went in just as the image, projected on an end wall screen, was switching from Mayfair, home of the rich and fashionable in London, to Soho, former home of "artists, bums, and revolutionaries." I guess I knew by that time that the films were probably the ones by two British artists I had decided not to see, my reason being, partly, that the artists were very young, 22 and 24, and so would reappear if they were any good, or when they were even better. Somebody else could decide that. But I did see them and then decided that there is really no time to be misguided. There are three films, from about 25 to 35 minutes long and originally shot in video, Super 8, and 16mm. The first is about the city (Driftwood, referring to the world of the skateboarder), the second about the suburbs (House and Garage), and the third about the country (Jungle). I began in the middle of the first film and saw the first half of it last. I was therefore in the middle of the city, with traffic coming toward me on Regent Street, which had been designed by John Nash in the early 19th century as a "'cordon sanitaire' between the scruffs of Soho and the toffs of Mayfair." Soho, which came next, "was laid out in the 1670s, just in time to accommodate an influx of Greek Christians fleeing Ottoman persecution and a larger wave of French Protestants forced out by Louis XIV." It's the least obsessive part of the film, and yes it is interesting what is said about Nash and the Greek Christians. Like a travelogue, except that the narrator is streetwise and very insistent on interpreting. It's familiar enough, how this part of the city has been gentrified, where "would-be-directors fill the pubs and clubs with turned up jeans and turned up noses," but there is something more going on. The city itself is opaque, unused except for purposes that have been determined for it, by class, government, commissions of various sorts, corporations. Everything is seen from street level (the skateboarder's or pedestrian's level) and necessarily from outside. People go about their business and settle in predetermined ways, but they are experienced from a peculiar angle. Nothing in the film fits the pattern for which it was designed by others. There are sections of facades and details of steps, railings, and overhangs. Everything is hard and unattractive, unforgiving, perfect for skateboarders but otherwise distant and adult. And then, finally, people live in this environment. Some shuttle through it on walkways, in cars and commuter trains. Others are cast out, if not literally kept out, by "the grotesque waste of marble and steel and clean streets," the obdurate lives of crazy people, drunkards, fanatics, and others who can't be fit in. The parade of images is extraordinary, things that we can see if we want to but usually choose not to. But the odd figures and images are not silent or part of an underworld. They are part of this world, accompanied by music and a narration of pure, literate contempt. 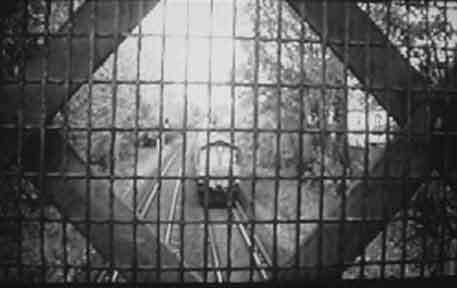 A freight train carrying cars on flatbeds moves endlessly under the bridge from which the camera views it, the narrator explaining the dire and hopeless effects of privatized transportation. 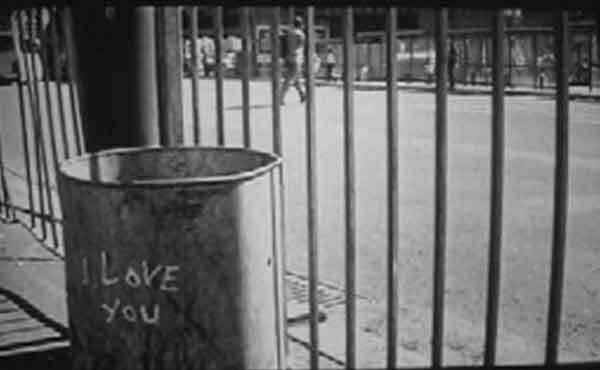 The skateboarder's world is a parallel universe which connects everything thought to be unseen and ends with the words "I love you" written on a trash can. The yearning and its denial are palpable. The narration concludes: "Navigate your city by an alternative means. Follow paths of smell, of sound, whatever. When a desire is a physical possibility, you must defy the stifling constraints of the social order and act upon your desire. Smash the symbols of the Empire in the name of nothing but the heart's longing for grace." Still ("I love you") from Driftwood. That declaration is fulfilled to a certain degree in the second film, but the constraints remain. The approach changes in House and Garage from the structured narrative of Driftwood. "It is true to the suburbs themselves," according to Relph and Payne, "and takes the form of a collage--drifting between domestic space, local recs and the awkward space where young and old meet." They call it "a romantic comedy," and so it is in terms of its familiar surroundings and antic behavior. Young people are now heard and seen, along with their elders. They dance, play music, tell stories. It is safe but also confined, or because it is confined. An observation scope and its lens stand in the way of an open landscape, which is slyly described by those attempting to view it as "Whistlery" and "Turnery." Again, it¹s a question of what to look at and what to use to look at it. 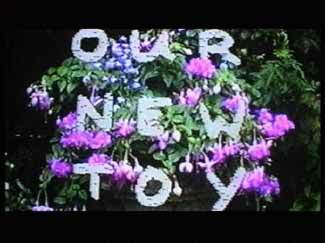 The film starts with an out-of-focus head of a young man, followed by that of a deer and a young man dancing in his room with the shades drawn. The emotional line of music and movement continues, but things harden into position, the spaces fill in, so that the dancing young man becomes the line-dancing older people. Toward the end are heard the words "Youth disappeared in a night" and so it seems that the town itself is a dream in which everything is random. 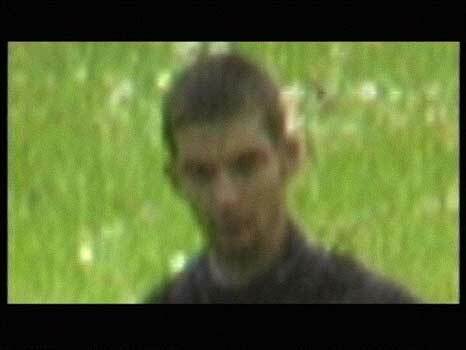 Still (Ben blurry) from House and Garage, 2000. Film, 35 minutes. The third film, Jungle, describes the horrors of the countryside in several rather sustained episodes, including a ritual night procession led by a man with a skeletal horse's head, farm scenes, a rabid, crowded contest over a fiery barrel, men in medieval dress fighting, a man describing the appearance of a UFO, a demonstration and counter-demonstration about hunting, a turkey slaughterhouse, and a group of young people walking through an ominous, dark wood at night around the scene of a crime--all about violence and death. Strange forces lurk everywhere, in people's minds, far from the city, linked with the city. Sound is completely ambient rather than made up, an inner sphere, unlike the first two films, which depended on narration and music. At the end, the UFO witness almost reappears as pixels accumulate and then is wiped out before he can appear--perhaps the strangest force of all. Relph and Payne claim to be neither artists nor filmmakers. "The only shocking thing about modern British art," they say, "is its total insignificance to anything going on in modern Britain." That might be said about any art for which market reality is the only reality. They pay attention to another possibility and to what is before us. The films were shown at Gavin Brown's Enterprise, 436 West 15th Street, New York, NY 10011.